While I don't do many commission pieces, I do get one every now and then and I try and go all out on them. It's usually someone that has seen my work and then contacts me with the job. That's a lie... I do tons of commission work these days. A few weeks ago, I had someone contact me for a single model. He had seen my twin-thunderhammer model here and wanted to know if I could make something similar for him. It was going to take some substantial work to pull off but I knew it was something I could do for him. Not all commissions come full circle though, there are a lot of reasons they fall short. From personal reasons, to price or whatever the case may be. This one ended up on the "cutting room floor" as they say in the movie business. But there are 3 things I would look for when looking if I were going to have someone do work for me. This is an absolute must. If they don't answer my emails or they're not clear with what's going on or taking the time to explain everything until I'm satisifed, I'm going to reconsider. If an artist is open and honest about doing stuff for you, they should be happy to answer all of your questions without any hesitation. I do this with my "clients." There are usually a ton of emails before the project even starts making sure I know exactly what my they want. They're paying for it and they should be the one in charge. Another thing is progress. I make sure to send WIP photos so they can see the progress and even make corrections if need be as their project progresses along. There are all kinds of levels of work out there. Some are Golden Daemon level, some look like a little less. You should have a real good idea of what your finished model will look like before it's even started. Don't be afraid to ask questions about how something will be done either. Remember, you're the one in charge. If you are looking for a particular look, color scheme or whatever... don't be afraid to speak up. You're not likely going to find Golden Daemon quality for basement prices but you should get what you're paying for. Everyone has a budget, shop around and get the most for your money. It goes without saying that the more work involved or the greater the challenge in completing your commission, the more you're likely going to have to pay. Whatever amount you decide to spend, make sure price is something you discuss up fromt and you know exactly what you're paying for. 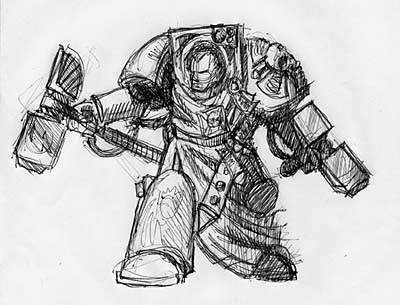 The top picture is a sketch of that twin-thunderhammer Terminator I was supposed to do, he would have been fun, but sometimes it just doesn't turn out. Getting something done on commission might be the only way you get that certain conversion or one-of-a-kind paint job you want. Just make sure that you're getting a good deal too. Running my own commissioning service with my buddy Pat, I know how much communication is important. Any time someone wants some sort of conversion, I will "shop" at varius bitz sites to find the cheapest prices, give them a run-down of the pieces I would use, why I'd use them and what they cost. Then I simply tell them that if they know of cheaper sites that I may not know of, to give me the link and I can trade them out to cut down costs for them. At this point, I've pretty much found my top few sites and rarely is there anything cheaper, but I digress. For those of you looking for commissions, don't be afraid to ask for pictures of their work and try to help find ways to cut cost. I've found that for conversions, there are SO many ways to cut the bits cost down, sometimes you just have to think outside the box. Always look for ways to save money but can get you the same result in the end. Most of the artists that do commissions will be more than glad to work with you and help cut the cost as much as they can! I agree in 100% with everything You said. And btw awesome miniature, where are the hammers came from ? terminators ? Akozz: The heads or from terminator hammers and the handles are sculpted. Having done a good bit of commission work of my own I understand what you are saying, however in my experience sometimes you have to push through and just get the job done even if you do not enjoy it or do not like the end product. So what happened? The sketch looks good but the final models looks nothing like it. Not criticizing, just wondering what happened? HuronBH: The top model was the inspiration for the project, the sketch was for the client to see... and then the client decided that he didn't want the conversion anymore (he hadn't even seen the sketch yet either). Running commissions takes tons of time and effort that most probably do not realize. Thanks for the great post. Now only if I did commission work! shame man, thats such a good sketch! great talent. I would love to take commissions on but how do you determine the cost per hours of your time?? That's a really good question. The short answer (for me) was to look around at what others were charging. Compare their work to mine and then figure out about what I could charge for my work. Per hour, not so much... I charge by the model and include such things as difficulty in painting, conversions, sculpting, freehand work, special techniques used and basing. @ King's Standard Bearer - Personally speaking (as a commission painter), I don't think cost per hour really enters into it. A painting service doing bare-minimum army-standard work in basic colors and at a high rate of speed might actually "break even," likewise a well-known painter selling a piece (maybe on eBay) for several hundreds of dollars with a straightforwards (but good) no-frills paint job. For the most part, though, I'd imagine that for commission painters that put in a reasonable amount of quality and effort and a reasonable amount of time, if you do the math I'd wager say that most don't even make "minimum wage" so far as time versus income. I think the key would be a regular turnaround of painted figures and an existing "fan base" to buy up finished pieces - you're either doing it full time, all the time, or as a "side hobby" that earns enough to pay for its own expenses. That's just from my own personal experience/observation, though.